I anticipated that our days would be punctuated by Bible stories and sweet child-like prayers, by gentle hands folded and soft “holy ground” whispers and wonder in worship. I envisioned candles lit around the Advent Wreath, special Lenten craft projects, and lots of singing and excitement about learning who Jesus is and how God desires us to live. Then I actually became a parent. And in the short 8 years since beginning this parenting journey, I have discovered that — much to my chagrin — my vision does not always match up with theirs’. While our home is filled with lots of music and we read our share of Bible stories and talk about Jesus a lot, reality looks a whole lot different than the picture I had in my mind when they were just babes. This past December, the Advent Wreath devotions were often accompanied by wiggles and silly faces, whining about dessert, and sometimes even talk about bodily functions, complete with…ahem….soundtrack. My son sneaks bites of his food while we’re praying before dinner; my daughter tattles that Little Brother isn’t paying attention and, 9 times out of 10 if I give them a choice between reading a Bible story or some other book from the bookshelf, they’ll choose the latter. I try to remind myself that all of this is normal. I try to focus on modeling rather than preaching, on encouraging rather than sighing audibly, on figuring out each child’s unique perspective, gifts and inclinations, and engaging them there. It’s the reason why our daughter’s journal is pink with butterflies and bling, and she uses a devotional “app” instead of an actual book. It’s why we read to our son out of the Lego Bible even though I personally prefer the lovely prose of the Storybook Bible. 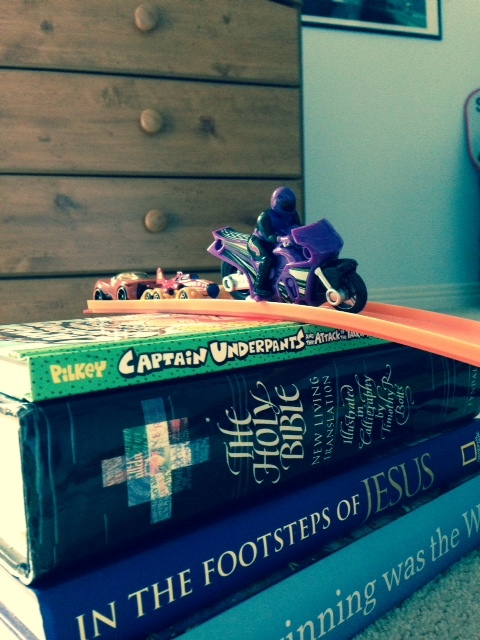 Yes, nurturing the budding faith of our kids often looks nothing like what I had imagined. And I’ll admit, when I ask one of them to pray with me before bed and I’m met with silence, or when I suggest reading a story from the Bible and I’m brought Captain Underpants instead, or when the congregation stands to sing a hymn and our two stay firmly planted in their seats doing word searches or — worse yet — making a list of all the potty words that they know (are we sensing a pattern here? ), my heart sinks a little bit. One of the greatest and hardest lessons that God is teaching me through my children, is this — the more I try to control others, the more blinded I become to the work of the Spirit right here in the unexpected messiness of life. In the words of my daughter’s favorite song, I need to learn how to “Let it Go.” It’s the gift that my own mother has given me over the years. Every time I pushed back against her invitations to pray with her, or read Scripture, every time I rolled my eyes at another church event or told her I didn’t want to go to worship, she met my resistance with love and grace and a deep trust in God. Every. Single. Time. This past Sunday, as my husband sang “Hosanna” with the praise band at the beginning of worship, my son sat in the front row clutching his palm branch and belting out every word. He tapped his feet and smiled broadly. He loves that song. Even though he won’t admit it. He loves to sing. Even though he swears he doesn’t. I hear him humming praise songs as he shoots his Nurf Gun in the hallway. Praises rising, even without my invitation. I smile at this “holy ground” moment. It’s nothing like what I had envisioned. But I relish it. I sit in the kitchen and listen to him, engrossed in his own world, held safe in the arms of our God who sees in my kids more than I ever could. And I let go a little more. Kelly Pittman shares life and ministry with her husband, two young children, and 1 lazy old chocolate lab. After staying home full-time with her kids for 8 years, she recently went back to work part-time, and serves as Interim Pastor to a small PC(USA) congregation in Fort Gratiot, MI. Kelly, this was deeply moving and inspirational! We are very blessed to have your family with us. Keep writing! I really enjoyed this! Great Story Kelly ! You are a great Mom and good wife. We are grateful that you are leading our church and we are getting stronger with your help. I to really enjoyed this. Kelly is absolutely awesome and I thank God she is at Lakeshore Presbyterian Church, if only for a short time. Her article led me back to the days when my children were young and not always well behaved in church. I think most parents have doubts about raising kids the “correct” way and Kelly’s article put into words what we have often thought about our own parenting skills and spiritual leadership. I am not surprised to read this story from Kelly. She is an absolute, wonderful interim Pastor to our church. She is a strong leader and a wonderful friend.